When the time comes to holidays and you can’t hide from a luggage preparation, then I firstly think about the comfort in every forms. I just can’t live without it. I am always afraid of the situation, in which I will feel myself uncomfortable and the feeling of lost will be in my heart, and that’s what I really fear the most. That’s why I always think about the comfort in a very first place, and talking about holidays, whether they are by the sea or in mountains, I always take with me those things, that will give me as much comfort as they can. 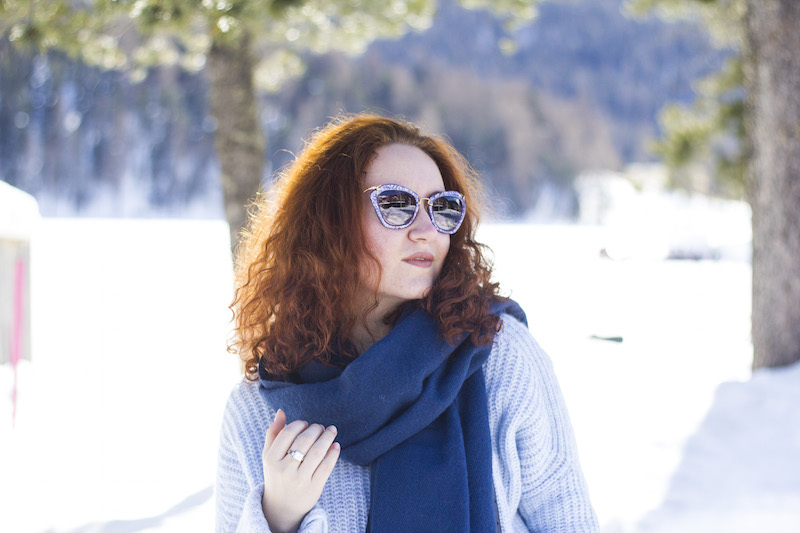 One week ago I had a pleasure to visit small town in Swiss Alps – St Moritz, and due to not warm enough weather (we had there something like -15 degrees), that’s why I took with me my favorite warm and comfy pieces. 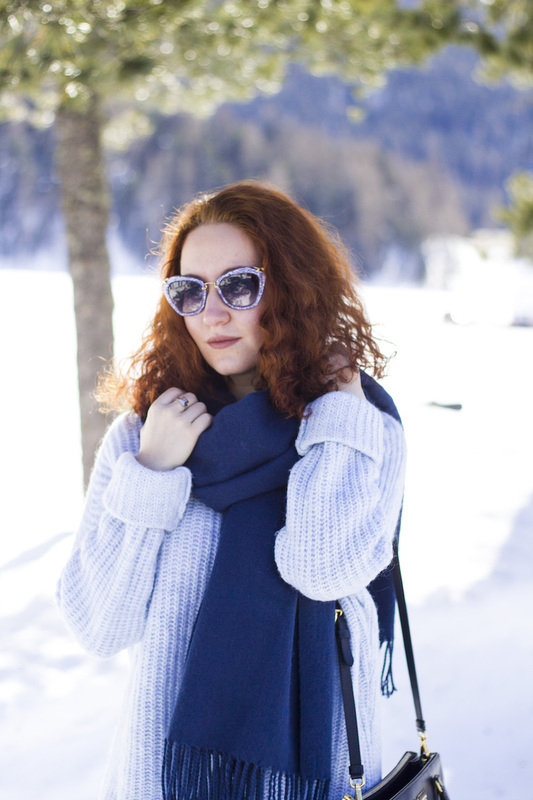 Of course I am talking about my favorite baby blue oversize and extremely soft sweater from Zara that I was looking for a very long time, and my new blanket scarf from Pieces that is very warming too. This garments I got for myself this year, I bought them at different times and I didn’t imagine that they will be looking great together. To make this outfit look more playful I wore my favorite glitter sunnies from Miu Miu. As a result, you can see me wearing all my favorite things in one outfit, which goes perfectly together! 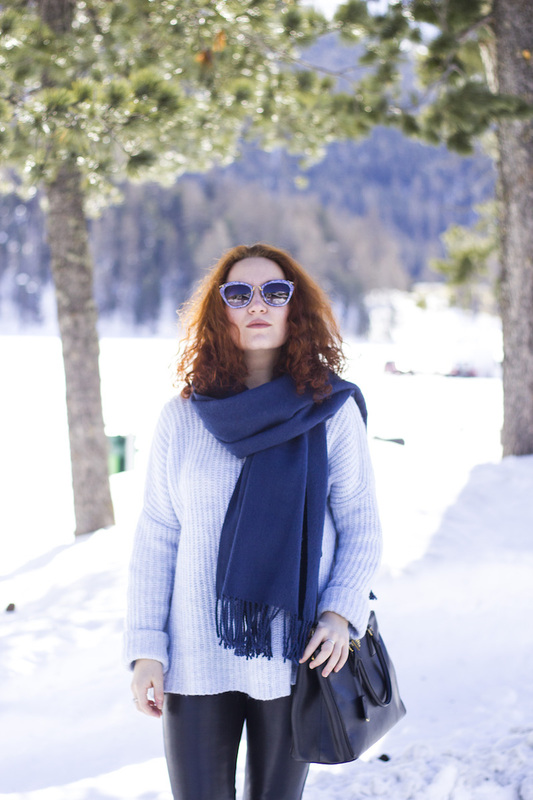 That’s how I was strolling in the streets in St Moritz for a few days when the sun was very hot, and it was warm enough to forget for two days about my outerwear. I love this look , your sunnies are just gorgeous ! I love your outfit here. You look so warm and comfy too. Amazing pics too! The snow is so nice! And you look beautiful! This whole look is perfection!! What a beautiful style. Thanks for sharing.